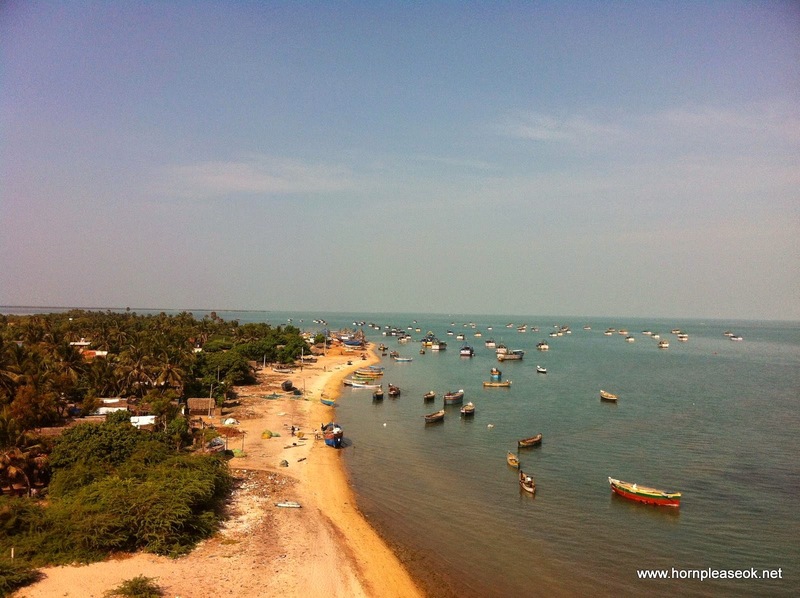 Coastal South India : Rameshwaram to Kovalam, Kerala | Horn please, OK? We’ve finally perfected the art of waking up early, getting dressed in half an hour and hitting the road. Practice does make perfect. Enthusiasm makes it easier. Driving a car that's more luxurious than your hotel room, that's the best incentive. 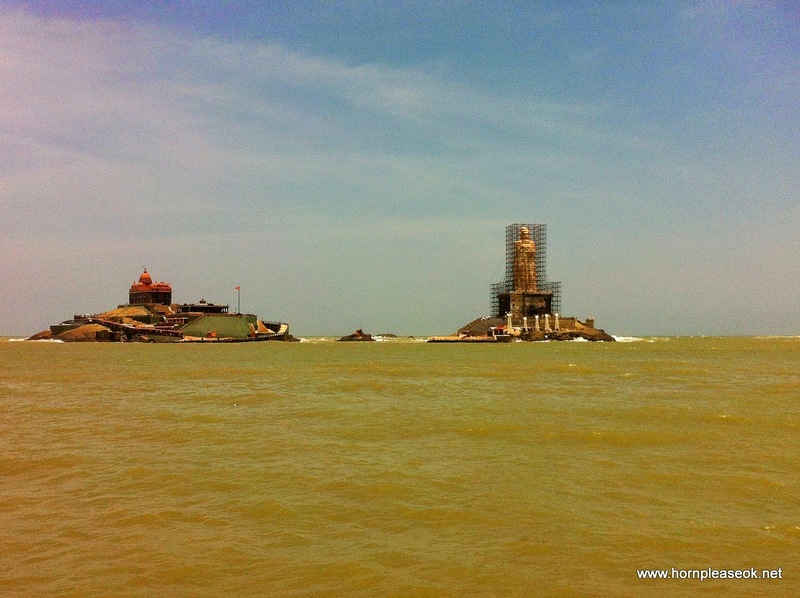 Legend meets religion at Rameshwaram. 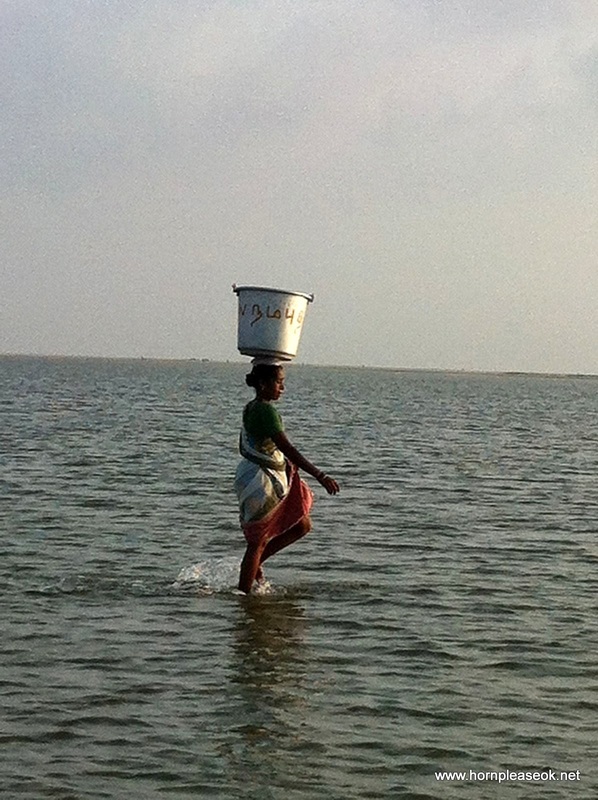 The temple town lies on the island of Pamban off the east coast of the subcontinent. 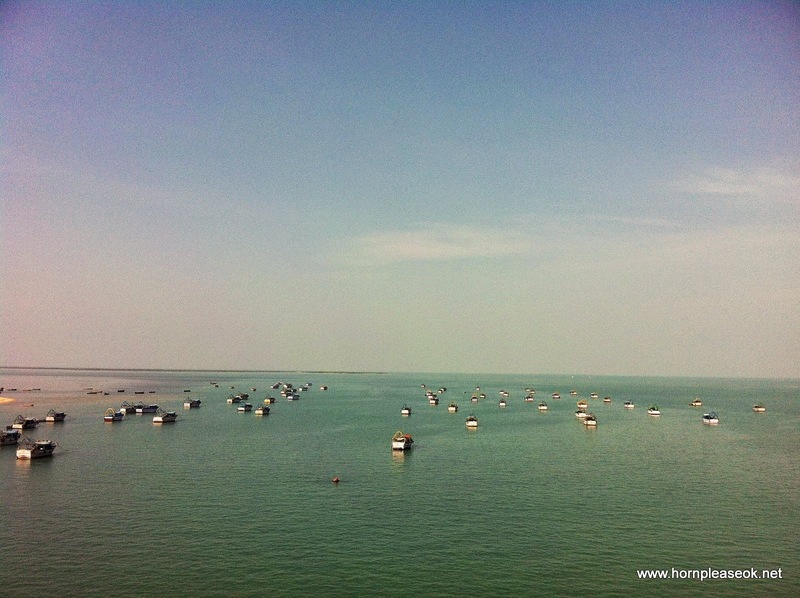 Pamban stretches from a small fishing village on one end to Dhanushkodi on the other. 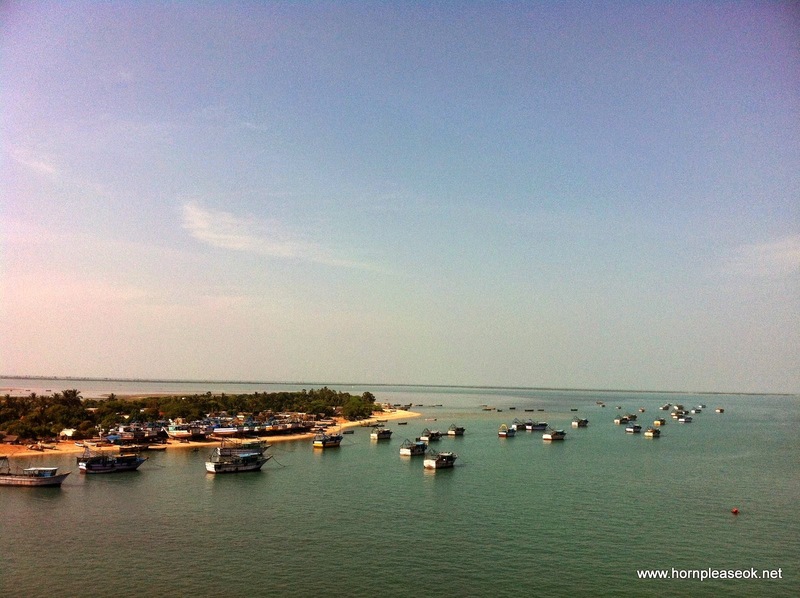 Its connected to the mainland via the famous Pamban bridge more than 2 kms long which offers a breathtaking view of the sea. If you peer over the edge you can spot multi colored fishing boats anchored near the mouth of the island. The Ramanathswamy temple in Rameshwaram is said to be the place where lord Rama prayed to lord Shiva for absolution of his sins after defeating Ravana. 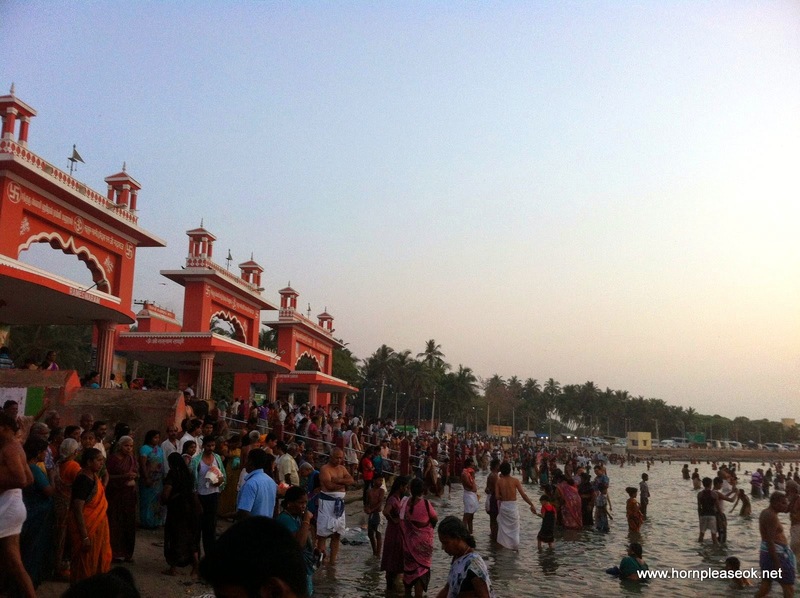 The temple has 22 ‘Teerathams’ or tanks containing holy water which devotees wash themselves in after taking a dip in the sea and before entering the inner sanctum to pay their respects to God. Acting on the advice of our hotel concierge and after turning on every single alarm clock we could lay our hands on, we woke up at 4 am and headed to the temple. Entering through the less crowded west gate we discovered a special entrance; 50 rupees can get you in and out of the sanctum in less than 5 minutes. Our special ticket took us to the doors of a crystal 'Shivlingam' and we were lucky to witness an 'aarti' being performed by one of the priests. Waking up at 4 in the morning clearly had its perks. Prayers said, blessings received (hopefully), clutching on to our tickets we got herded out only to realize that we’d just experienced the last stage of the ‘Rameshwaram experience', first. More observant, less sleepy people would have noticed that every other person in the queue was dripping wet. But, God can be flexible, especially that early in the morning, and so we proceeded to where the devotees take a holy dip. The walk from the temple to the sea is through a narrow road packed with people, cows, shops and cars. Stepping gingerly over squelchy mud, cow dung and the occasional errant child, we found ourselves in front of four towering orange arches. These define the entrance to sea. 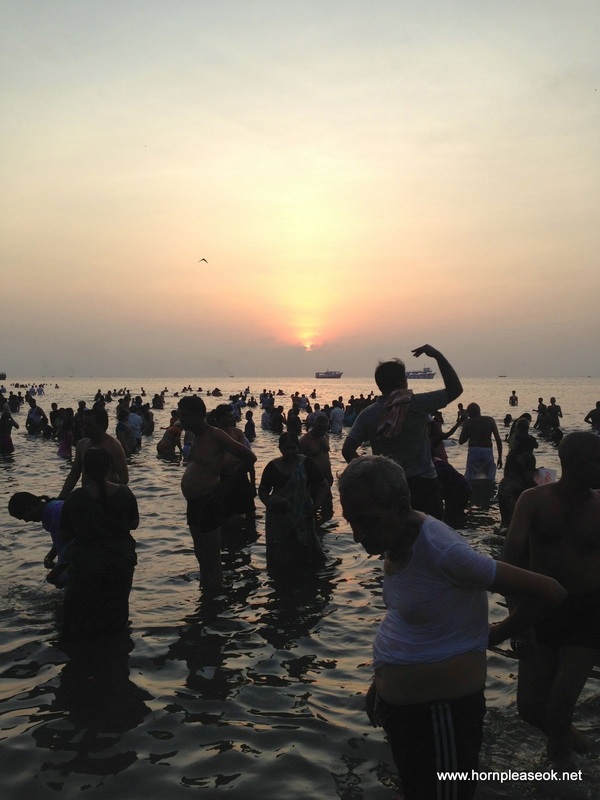 There were still a few minutes left for sunrise and people were in different stages of their rituals. Some chanting shlokas, others splashing their face and hands. People lighting diyas and floating them, people immersing themselves in the water, people dunking their friends and having a good time. People and more people. Everywhere. It was a sight like no other. Especially for the religiously uninitiated. 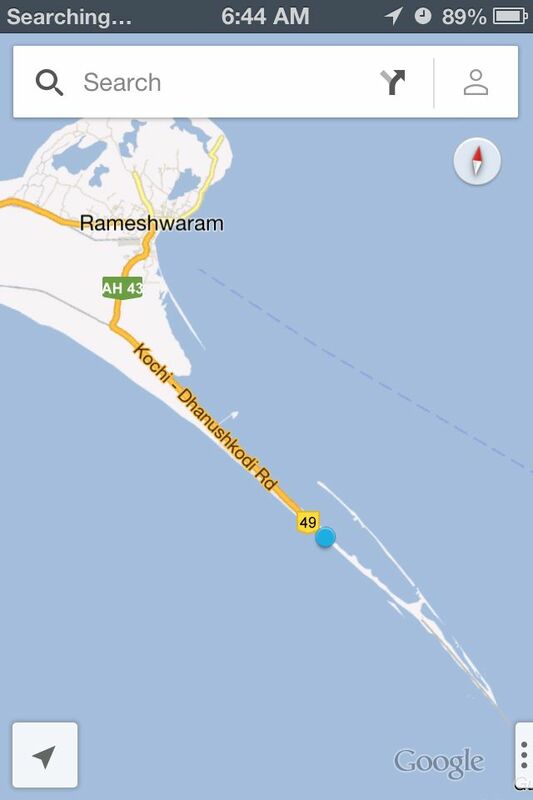 It takes twenty minutes to get to Dhanushkodi from Rameshwaram. If you're driving a Koleos that is. The 20 km, four lane road is in excellent condition, as straight as an arrow and flanked by water on both sides. The initial view of towering trees on either side gives way to beach foliage and shrubs which eventually melt away exposing large expanses of white sand. 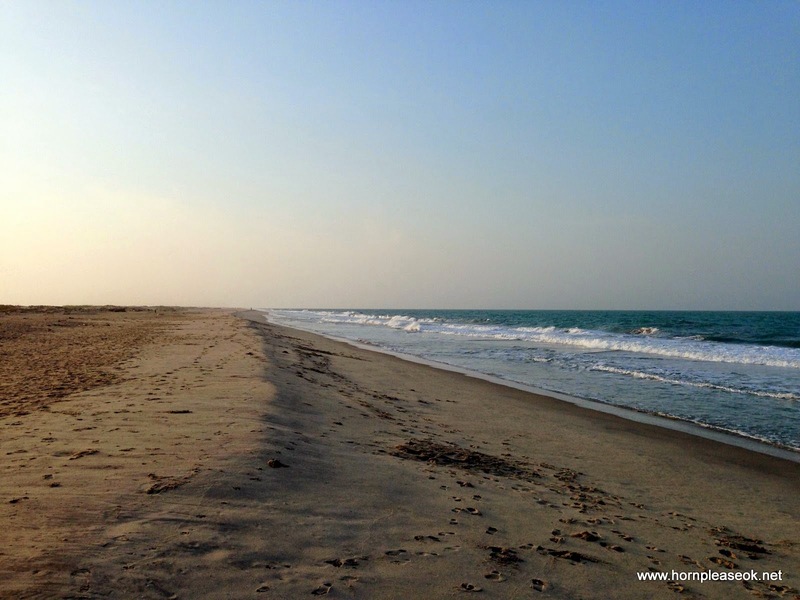 Dhanushkodi was once a vibrant, thriving town with temples, a railway station and a port to ferry passengers to Jaffna in Sri Lanka. The shifting of tectonic plates under the sea caused a large chunk of the town to get submerged. A cyclone in 1964 destroyed what was left of it and the government of Tamil Nadu declared Dhanushkodi as unfit to live in. But what the ghost town is probably most famous for is the point from which Rama Setu or Adam's bridge connected India to Lanka. They say that this bridge could be crossed on foot till the 15th century after which a natural disaster caused sections of it to sink. The four lane road ended in a muddle of shacks. At 7 am, we were the first tourists to get there. The place looked eerie and deserted. 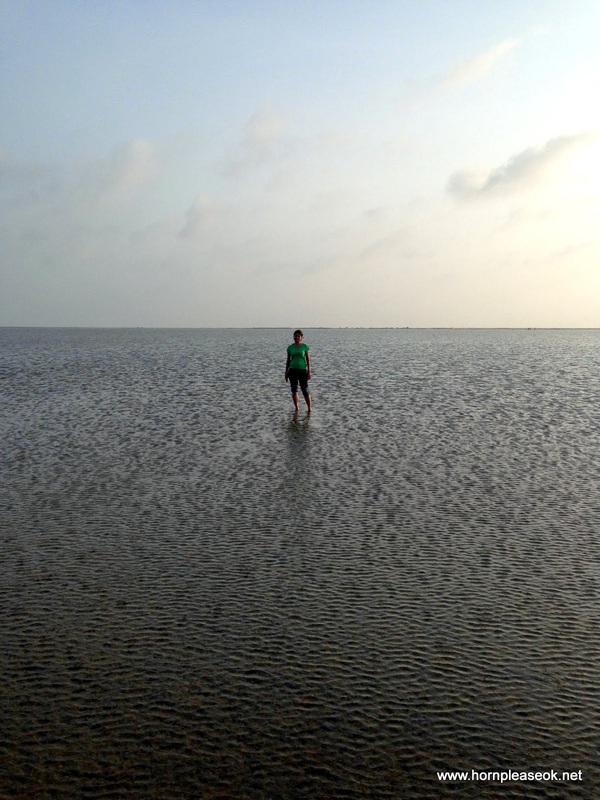 We walked past the shacks to a stretch of sand from where you could see the Indian ocean, green and angry on one side and the Bay of Bengal, clear and placid on the other. The only way to get to the tip of this stretch of sand is to hire a jeep that will drive you there to see the remnants of the ghost town. Private cars are not allowed. Sadly we'd gotten there too early and there were no jeeps to hire, so we did the best we could on foot. It didn't take us to the ghost town but this is what we saw. The whole place is shrouded by a feeling of melancholy and neglect and what should be a serene sight, makes you mildly uncomfortable instead. 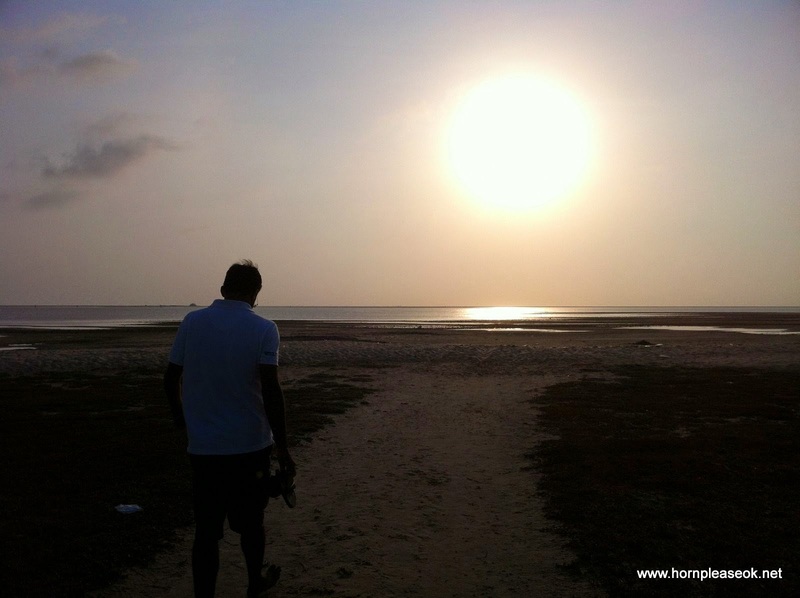 There are a lot of sad stories and natural disasters associated with Dhanushkodi. If you believe in legends and myths, almost like a curse. The drive from Rameshwaram to Kanyakumari, a distance of 360 kms, continues on the ECR and is pleasant, taking just about 4 hours. 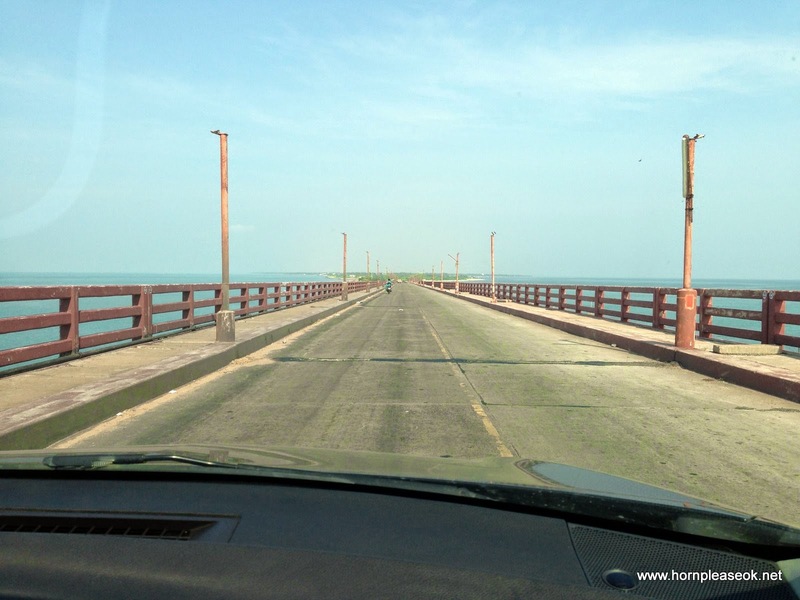 We made our way back from Rameswaram across the Pamban bridge, this time in daylight, enjoying a full view of the sea on either side and the Indian mainland in front. 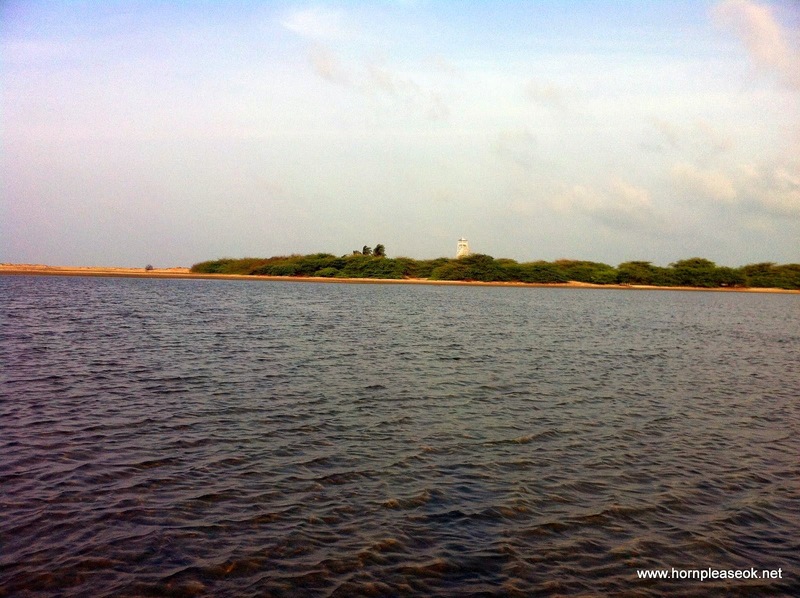 The plan was to bypass Tuticorin and head towards Kanyakumari on the national highway. 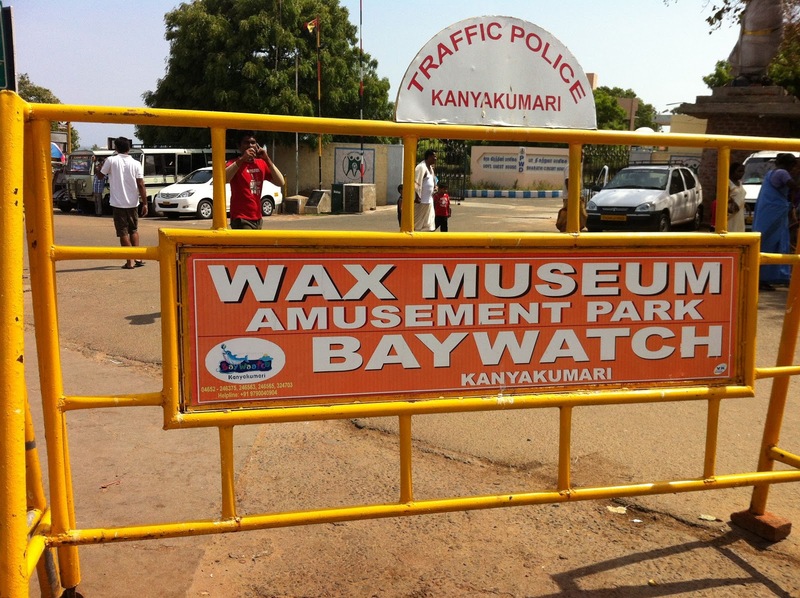 Since the Ramanathapuram bypass was closed for maintenance we had to drive through the main town, which added to travel time. On joining the ECR again, the ride was smooth – wide scenic roads with a smattering of traffic. 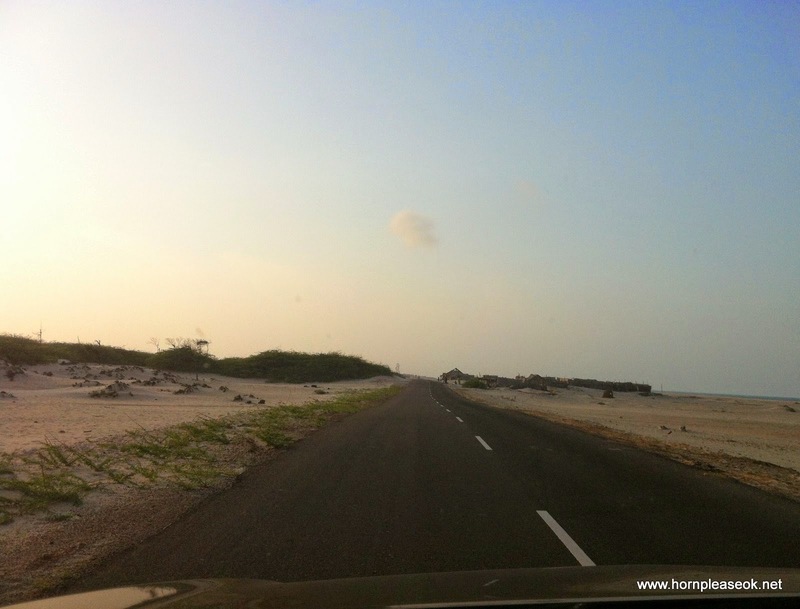 The ECR ultimately joins NH45B at the outskirts of Tuticorin where you need to take a left towards the city. From here, the best way to get to Kanyakumari is to go via NH7A and then join NH7 which will take you all the way south. The right turn for NH7A is a 10 min drive after the toll booth on NH45B and can be missed as its under a bridge. Once on it, you get to drive on a 4 or 6 lane divided expressway almost all the way till Kanyakumari. 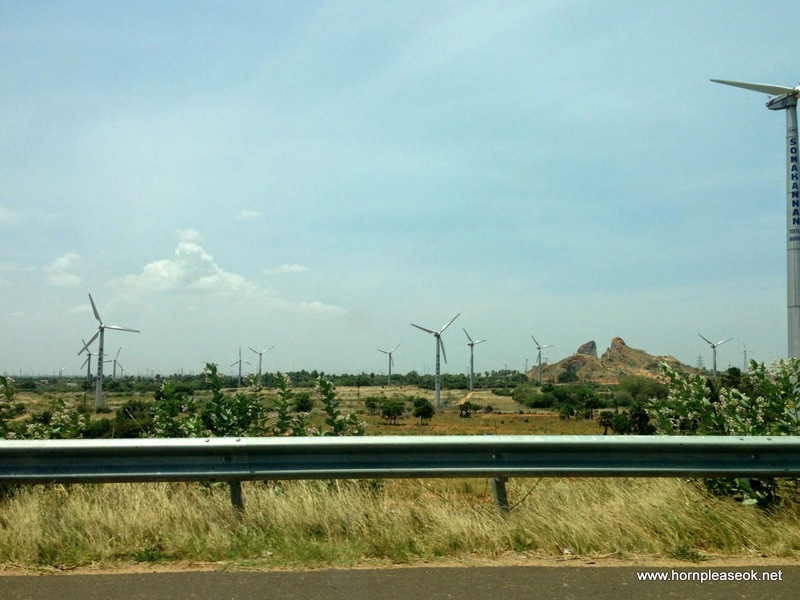 The road cuts through expansive wind farms, enhancing the driving experience immensely. 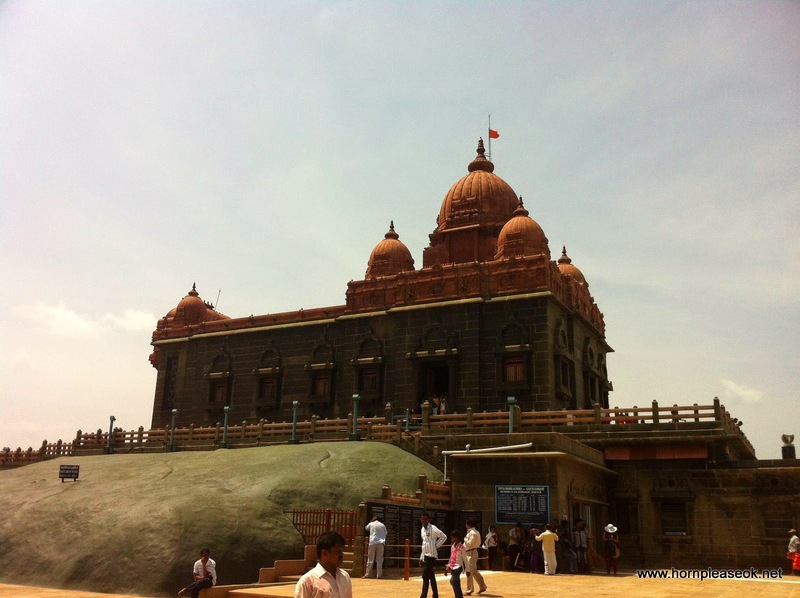 Not wanting to spend a lot of time at Kanyakumari, we chose to only visit the Vivekananda rock before driving on to Kovalam (There's also a museum and some temples we're told). The rock is said to be the southern most point of the Indian mainland and also where the Bay of Bengal, Indian Ocean and the Arabian sea meet. 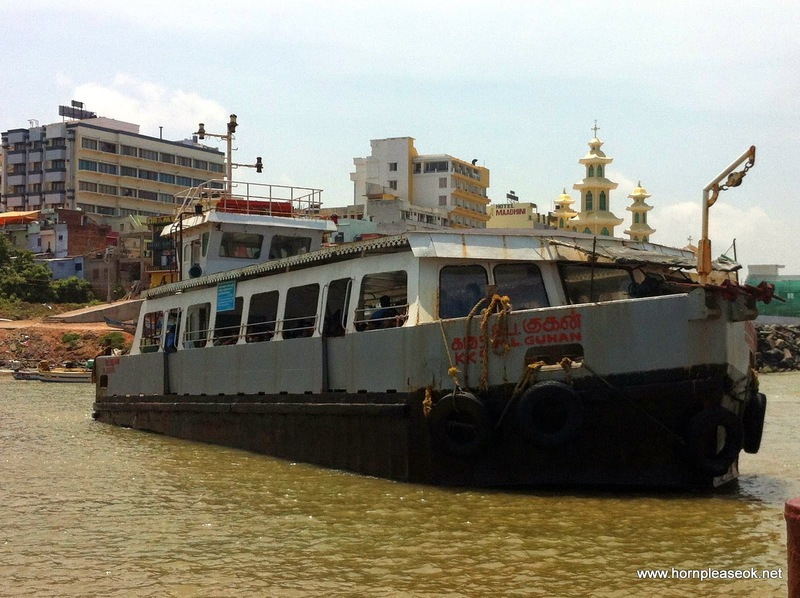 There's a ferry that takes you across every ten minutes and you can either buy a regular ticket for Rs 69 and wait for over twenty minutes or buy a special ticket for Rs 169 and cut ahead to the beginning of the line. You get one guess for which ticket we bought. Once on the rock, we had to clutch on to our clothes, hair and possessions lest they fly away. The wind is so strong it can knock you off your feet. 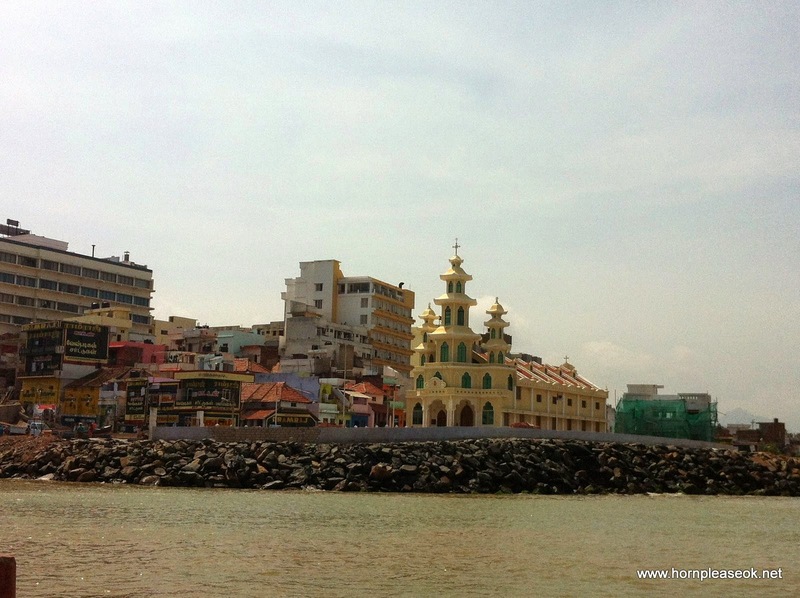 The rock houses a meditation hall and a prayer hall with a large statue of Swami Vivekananda . 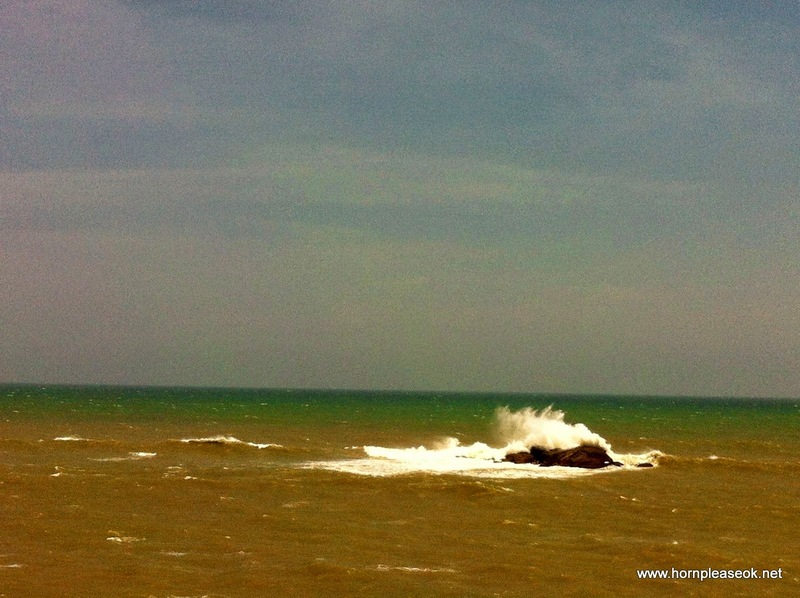 One side of the rock offers you a view of the choppy waters and the other side, a view of the mainland and Kanyakumari town. 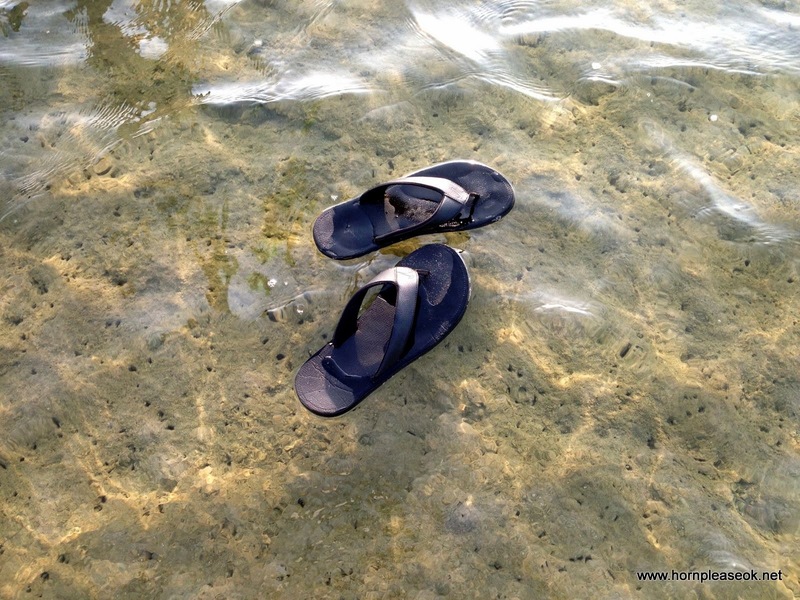 On a sunny day you'll be able to spot three colours in the water - blue, green and brown. 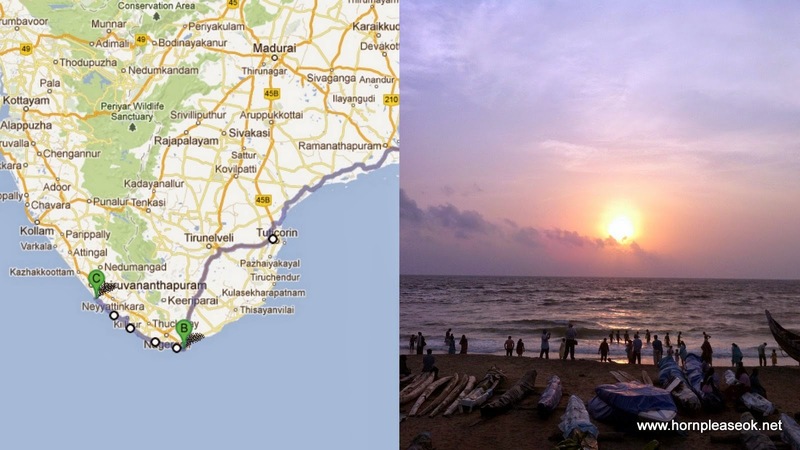 Driving from Kanyakumari in Tamil Nadu to Kovalam in Kerala is a totally different experience when compared to the previous stretch. The roads are narrow, potholed with slow moving traffic. This could also be because we chose the “scenic” route along the coast which comes with its own upsides. 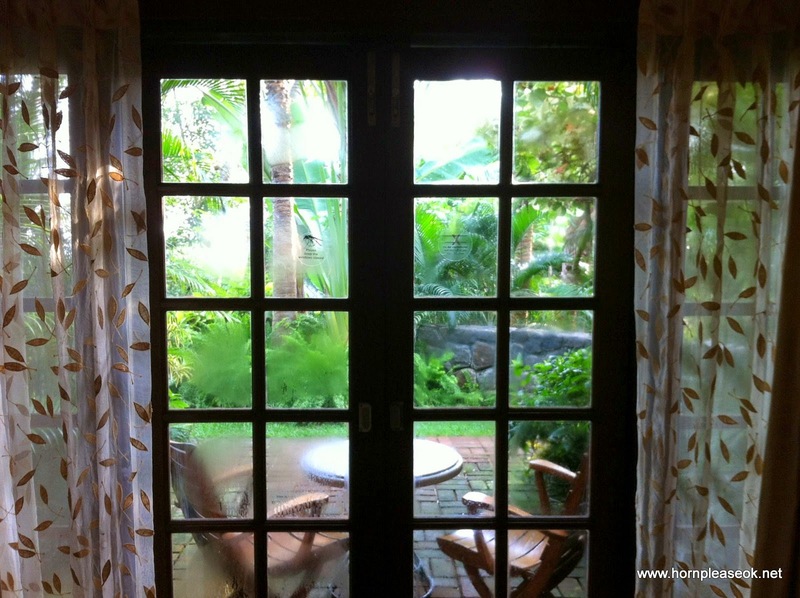 Palm trees and backwaters around every corner with occasional glimpses of the Laccadive sea on our left. It took us about 2.5 hours to reach Kovalam (distance of ~90 km). If like us, you do decide to take the route that hugs the coastline, you will need to rely on Google maps or any other map app as there are very few road signs and many turns. When we thought we wouldn't last one more turn the final one took us into the arms of the ever gracious Taj Vivanta Hotel. 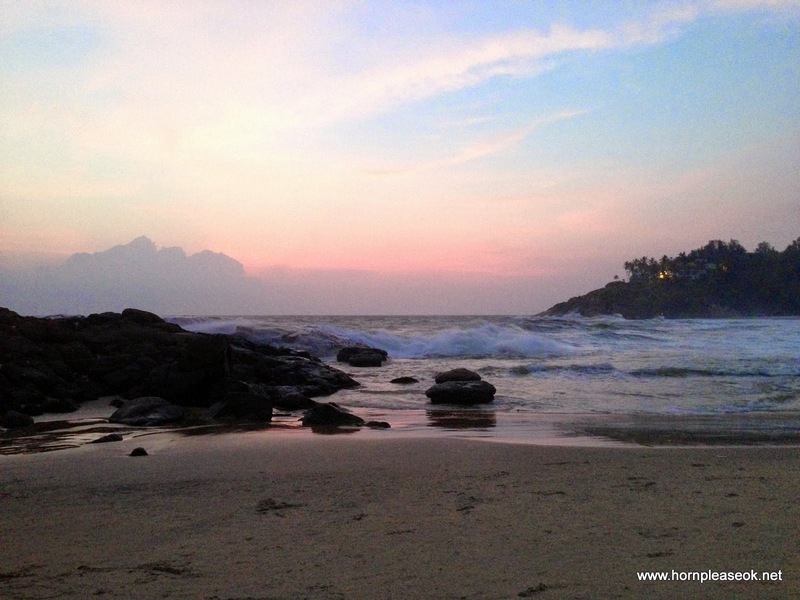 The Vivanta, Kovalam is perched on a cliff with a clear view of the backwaters and a partial one of the sea. 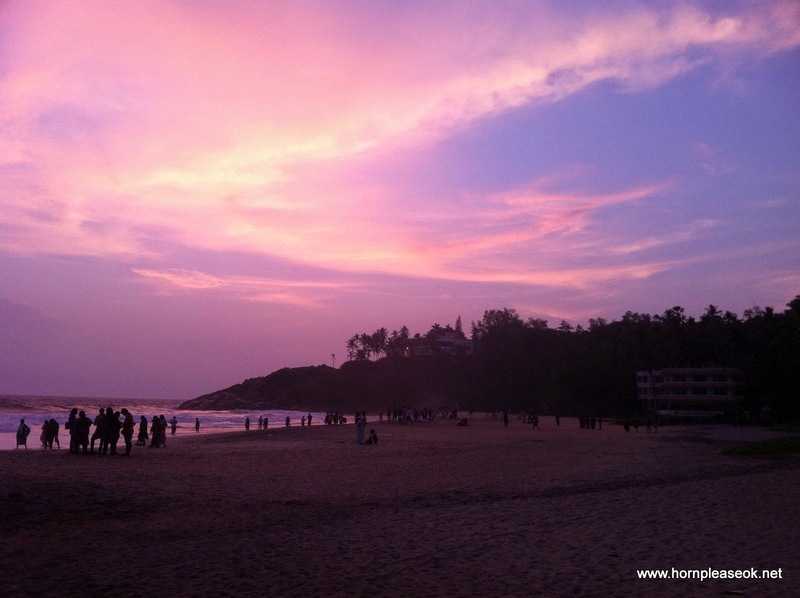 It has its own private beach which is open when the sea isn't as rough, in the months of September and October, the best time to visit Kerala. 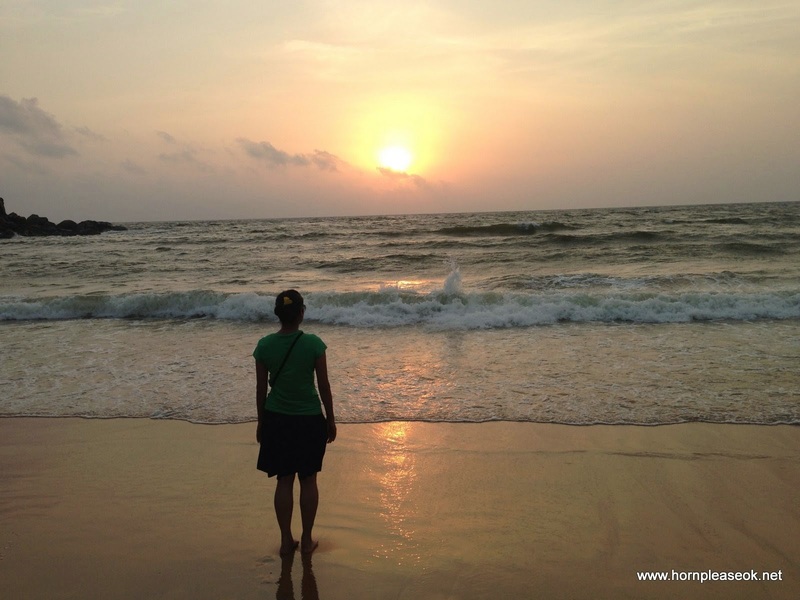 After we let the hotel spoil us a bit we set out to look for Kovalam beach. Its a narrow stretch of sand part of which has been cordoned off by the Leela hotel. It looks like any city beach. 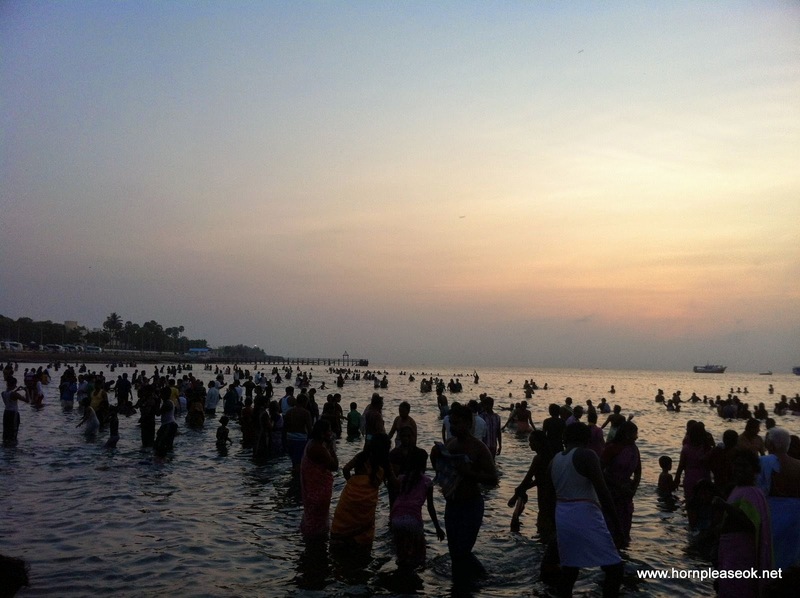 Being a Saturday it was crowded and having had our fill of the raucous junta we headed over to Hawah beach. A much nicer beach and pretty enough to make us want to stay for the sunset. 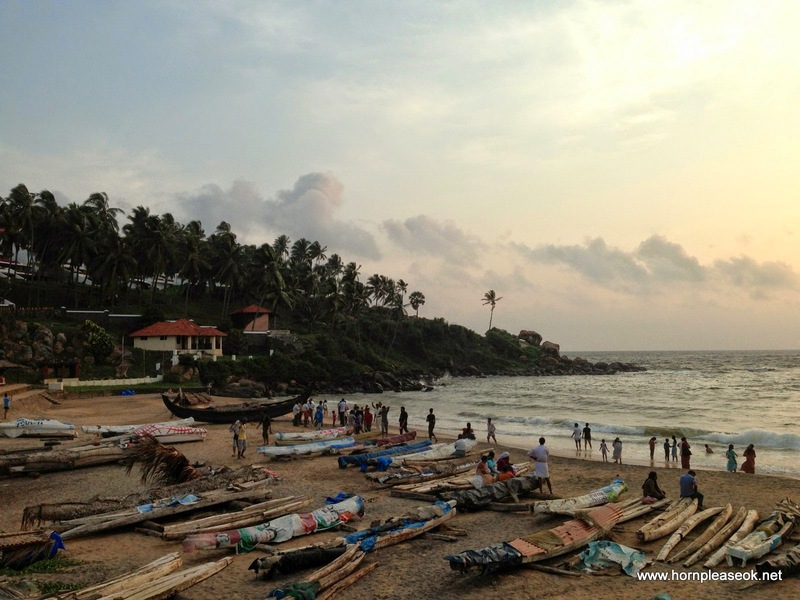 Travel Tip: With a long coastline, Kerala has some of the best beaches in India. The best time to plan a trip here is in the months of September and October. A little later and you'll hit peak tourist season. A sunrise and a sunset on the horizon on the same day! We've crossed over from the east coast to the west, an inflection point in our long journey. Our tripmeter reads 1500 kms and the color of our tan resembles a well done steak.